I usually have a huge distaste for demons, both the Christian kind and the MTG kind. However, the synergy and lore around Krav and Regna peaked my interest. There appears to be a kind of dark, eldritch Romeo and Juliet relationship between them, each probably with their own agenda. Then I looked at other angels and demons: their lore, mechanics, effects and their names. I started matching them together so that each demon and angel in this deck have a partner, or prospective partner. 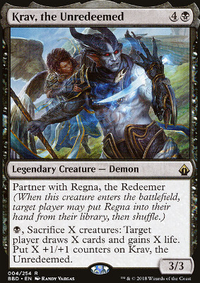 I also kept Regna's effects in mind, so there is a bunch of lifelink and life gain methods in this deck. So here is my Forbidden Love deck. Angelic Field Marshal + Demon of Wailing Agonies. Since they both possess the Lieutenant mechanic, hence they are the Lieutenants of the deck but they apparently mix business with pleasure. But like their Generals, they have their own agenda. Angelic Field Marshal gets +2/+2 and gives all creatures vigilance, including her partner. Her other unholy half however ensures that my opponent sacrifices creatures when he deals combat damage. Once a demon, always a demon. Angelic Overseer + Overseer of the Damned. Yes, primarily the reason these two are paired up is because they both have Overseer in the name. Angelic Overseer is concerned with humans and life, and Overseer of the Damned in concerned with death and zombies. They are perfect polar opposites. If I possess a human, Angelic Overseer has hexproof and indestructible. If any nontoken creature dies, Overseer of the Damned provides me with 2/2 Zombies that I can feed to Krav, who gives me life gain and card draw. Requiem Angel + Harvester of Souls. The angel deals in spirits, and her demonic lover in souls; in some cultures, these are one in the same. Whenever a nontoken creature dies on my side, I get Spirits; in addition to sacrificial fodder, I get to draw cards thanks to Harvester. Demonlord Belzenlok + Lyra Dawnbringer. These two are together because they are polar opposites, and because in my opinion, they look like one heck of a power couple. 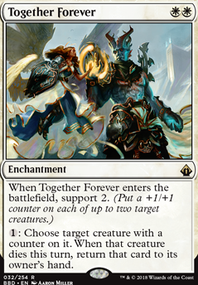 Lyra boosts the angels while Belzenlok boosts agendas. Reya Dawnbringer + Deathpact Angel + Kothophed, Soul Hoarder, my only love triangle. Both the angels and demon work with the graveyard: Reya resurrects creatures from my grave, Deathpact resurrects herself from my graveyard, and when an opponent's graveyard gets filled, Kothophed makes me lose a life but gain card advantage. Seraph of Dawn + Razaketh, the Foulblooded. The Seraph gives me life, and Razaketh uses that life to get the cards and partners I seek. 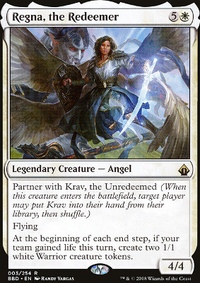 Avacyn, Angel of Hope will be paired with the Archfiend of Despair, as soon as I get my hands on one. They are paired mostly because the opposites in the name - hope and despair. Avacyn protects every nonland permanent. The Archfiend ensures that my opponents sink lower and lower, draining their life. For Emeria Shepherd, she will be partnered with the landfall Ob Nixilis. The deck also bears references to love itself. Increasing Devotion may refer to spirituality but it can also refer to growing feelings. Together Forever is clear imagery. Holy and Unholy opposites are included, mainly in name. Demons usually demand blood in sacrifice or as payment, hence Blood Divination, Sign in Blood and Bankrupt in Blood are included. I hope you like the deck! Any comments or suggestions are most welcome!